Kosher Info: All Jewish life in Venice is clustered inside the former Ghetto area of two compact squares – Campo di Ghetto Nuovo and Campo di Ghetto Vecchio. Here you can find two meat kosher restaurants: Gam-Gam, which is owned and operated by Chabad, and Le Balthazar with the adjacent new kosher hotel Giardino del Ghetto (same ownership) under the supervision of Chief Rabbi of Venice. It was packed in Gam-Gam on Thursday night, so reservations are recommended. The food was tasty and the service efficient, but the menu was mostly Israeli style with just a few Italian selections. On Shabbat Gam-Gam hosts communal meals (free, but donations are appreciated). They told us that in the summer they had up to 700 guests each week eating in shifts! During our October stay it was less crowded, but the restaurant was full nevertheless. Le Balthazar also offers Shabbat meals, which you have to pre-pay. During our visit they hosted a morning Kiddush for everyone in their quaint backyard garden, so we got a glimpse of Le Balthazar’s cuisine and atmosphere. I must say, we were rather impressed, both the fresh authentic Italian delicacies they served and the lovely décor contributed to an extremely pleasant experience. There is another small B&B in the Ghetto – Locanda del Ghetto, which only serves catered kosher breakfast for its guests. There are also two kosher bakeries – one was never open while we were there, and the other had a nice selection of breads and pastries, and sold kosher packaged products and wine. The bakery is apparently owned by non-Jews, since it was open on Shabbat, while displaying two kashrut certificates. Chabad also runs a small makolet, where you can buy some dry goods and dairy, but it does not have set operation hours, so you need to arrange with them to open it. Another dining option is the dairy cafeteria in the Jewish Museum of Venice, open during the museum hours. We tried it and were pleasantly surprised, as it offered simple but yummy Italian dishes and heimishe service. Finally, we discovered a gelateria Il Gelatone within a 5-minute walk outside of the Ghetto: all flavors marked with a K are kosher, but cookie holders are not permitted – ask for a paper cup. 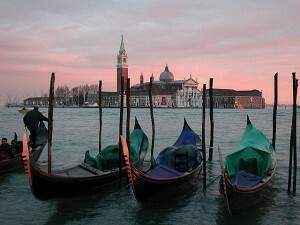 Travel Info: Considered an ultimate romantic city with its web of narrow streets and myriads of canals, cozy squares, dreamy bridges and unique architecture, Venice would indeed be so if not for the masses of tourists. But even with the Manhattan-like crowds, the place is worth touring. 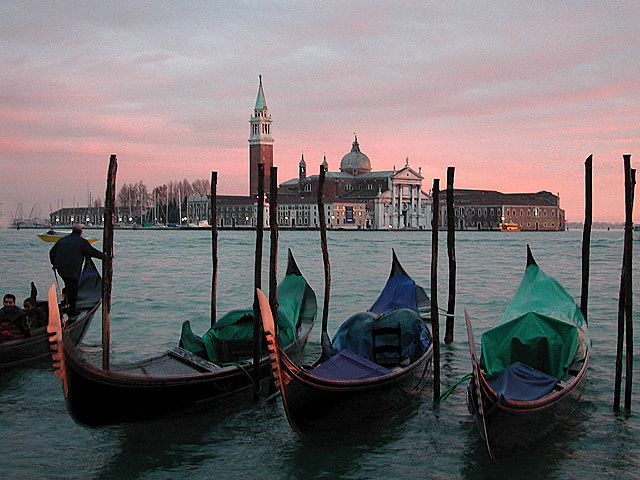 Many day-trippers never get to explore Venice beyond the St. Mark’s Square and a gondola ride. In fact, the city has a number of interesting museums and palaces one can visit, but the best part is just to roam through Venice, discover some back streets which no tourists reach, get lost in the narrow lanes and be amazed by the past grandeur and the ongoing struggle with the water to keep the history from decay. The Venetian phenomenon of acqua alta (“high waters”) caused primarily by the exceptionally high tides in the Adriatic Sea and magnified by the Venice’s continuous sinking into the lagoon, brings about periodical flooding of the area and challenges the upkeep of the suffering buildings. Take a vaporetto (waterbus) ride along the Grand Canal – the once magnificent facades are somewhat dilapidated, but still charming. 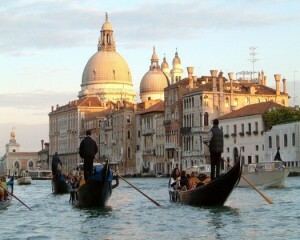 During the “high waters”, which foremost hit the overwhelmed by tourists San Marco area – the city’s lowest point, people navigate on raised platforms, and traffic can be slow. By all means, take some guided tour once in Venice to learn more about the rich and interesting history of the Venetian Republic. Both the Doge’s Palace “Secret Itineraries” tour (where they bring you to otherwise inaccessible floors of the palace) and the Clock Tower tour we took were very engaging and are highly recommended. The Doge’s Palace and the Clock Tower are both located on the famed Piazza San Marco together with the Basilica San Marco, the Campanille (bell tower) and several museums. Cafes with outside seating on the Piazza feature baroque and jazz music bands, and at night the square becomes a scene of “dueling orchestras”, when bands from different cafes take turns in showing off their virtuosity. If you have a chance, visit other islands in the Venetian lagoon. Murano Island, famous for its glassmaking shops, is an interesting option, where you can catch a glass-blowing demo and purchase discounted (compared to Venice) glass pieces. 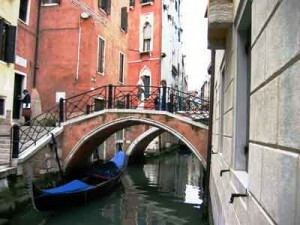 Jewish Info: The Ghetto area is the center of the Jewish life in Venice. Venetian Ghetto is the oldest in Europe – in 1516 it was decreed that Jews are to live in the small area in sestiere Cannaregio where the old foundries (geti in Italian) were located. Due to the guttural pronunciation of the German Jews who first settled in the geti area, the word “ghetto” appeared. Initially the Jews were given the Ghetto Nuovo, but later the Ghetto was enlarged to include Ghetto Vechio (the names of New and Old refer here to the new and old foundries, not sites of Jewish settlements). The Ghetto was closed at night, and the surrounding canals were patrolled by Christian guards. The Ghetto was abolished with the Napoleon’s conquest in 1797. Several thousands Jews lived in this pretty confined area of two squares. Unusually high buildings with subdivided floors are the result of the cramped living conditions. The synagogues in Ghetto Nuovo are located on the top floors of the buildings. Five beautiful 16th century synagogues (called Scole) are well-preserved and can be seen on a guided tour through the Jewish Museum of Venice. Two synagogues are open for services (the Levantine Scola in the winter, the Spanish Scola in the summer), with other synagogues functioning during the holidays. Aside from the synagogues and the Jewish Museum, there are two Holocaust memorials, Beit-Chabad and their small yeshiva, and a bunch of Judaica stores in the Ghetto. For additional details check the Jewishitaly.org website.